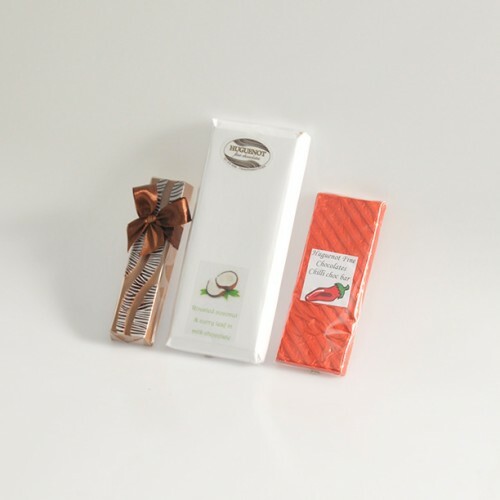 Our Amarula, Coconut & Chilli Set is made up of three assorted Belgian chocolates. A decadent African Amarula bar, a coconut and curry leaves slab and a flavour intense chilli bar. This is a perfect gift for those with a taste for the exotic. Our cinnamon cup, otherwise known as melktert has always been a popular favourite!.. Our Apricot Ganache has an original taste of apricot and is topped with an apricot sliver..
Our Dipped Ginger is made with glace ginger pieces dipped in smooth dark chocolate..